NEW DELHI: In a first for the country, online marketplace for pre-owned vehicles Droom has launched a national repository for used vehicles. Monickered 'History', it curates historical data to deliver in-depth information about a vehicle's background to address issues related to a vehicle's safety. "The market for used automobiles in India does not match up to those in the US and Western Europe because of lack of trust, owing to unavailability of verified information about a pre-owned vehicle," says founder & CEO of Droom, Sandeep Aggarwal. "With History, we are trying to provide vital vehicle-related information to prospective buyers within minutes, fostering greater trust and transparency in this segment," he adds. The process of generating the History certificate for a vehicle has been made simple. All users have to do is enter the vehicle's VIN or registration number and check for the availability of the certificate. If the vehicle certificate is available in Droom's database, users can make an online payment to get the certificate within half an hour. With this, the company has vehicle information in over 18 unique data fields from 1000+ RTOs across the country. It currently has information about more than 19 crore private and commercial vehicles in its database. "The used vehicle market in India often faces issues such as low transparency and a distinct lack of trust between buyers and sellers. We aim to plug this information gap with History," says Senior Director - Product and Technology at Droom, Somendra S. Rathore. "Integrating disparate IT systems and producing our own data science and machine tools over the past nine months has been a colossal task, but we are confident that India will embrace a more digitally-driven economy," he adds. In a first for the country, online marketplace for pre-owned vehicles Droom has launched a national repository for used vehicles. Monickered 'History', it curates historical data to deliver in-depth information about a vehicle's background to address issues related to a vehicle's safety. "The mark for used automobiles in India does not match up to those in the US and Western Europe because of lack of trust, owing to unavailability of verified information about a pre-owned vehicle," says founder & CEO of Droom, Sandeep Aggarwal. "With History, we are trying to provide vital vehicle-related information to prospective buyers within minutes, fostering greater trust and transparency in this segment," he adds. "The used vehicle market in India often faces issues such as low transparency and a distinct lack of trust between buyers and sellers. We aim to plug this information gap with History," says Senior Director - Product and Technology at Droom, Somendra S. Rathore. "Integrating disparate IT systems and producing our own data science and machine tools over the past nine months has been a colossal task, but we are confident that India will embrace a more digitally-driven economy," he adds. New Delhi: Automobile marketplace and services platform Droom on Thursday unveiled a data repository of used vehicles in India called History. The product enables buyers and sellers to access historical information of a vehicle, derived from various sources and presented in a certificate-like format. A user has to simply key-in the vehicle's registration number and will get details such as the date of purchase, past accidents, change of ownership, service history, etc. Droom claims it has data for 190 million private and commercial vehicles currently in use. While the service is currently free, Droom expects to put a fee on it in the future, said founder and chief executive officer (CEO) Sandeep Aggarwal. The company is investing in services having launched vehicle price calculator Orange Book Value and vehicle inspection services under Eco and expects to monetize some of them going forward, Mint reported on 1 December. We are creating an ecosystem for services which go along with the transaction of a used vehicle. In the near future we will be launching something called Droom Credit, where an auto loan decision will be taken in 30 seconds completely digitized with the help of UID," said Aggarwal. Droom, an online marketplace for automobiles, has launched 'History' which will provide prospective second-hand vehicle buyers a comprehensive certificate on the product's background. "History is an unbiased certificate which curates historical data available through various authorised data providers to deliver in-depth information about a vehicle's background. "Generated using our proprietary technology, the certificate will address issues related with a vehicle's safety, trust, and value," Droom Founder and CEO Sandeep Aggarwal told reporters here. He added that unlike the US and Western Europe, India is a low trust market, especially for used automobiles. "Many aspects of a pre-owned vehicle, such as ownership history, title dispute, and vehicle-related issues, are non-reliable. This is largely due to the unavailability of verified information about a pre-owned vehicle," he said. With History, there will be an information repository for used vehicles and will help foster greater trust and transparency in the used automobile segment, he said. History will have information about more than 19 crore private and commercial vehicles like cars, two-wheelers, taxi and trucks in its database with real-time information of nearly 6 million vehicles from the Delhi-NCR region alone. During the first phase of the launch, Droom will put up listings with valid RC numbers on its platform. The front-end will also be soon opened to users, giving them access to the most accurate, real-time information about used vehicles. Users will have to enter the vehicle's VIN or registration number and check for availability of the certificate. If the vehicle certificate is available in Droom's database, it will be sent to their registered email address. "The information can then be leveraged by users to make better purchases, ensuring the security of their investment and offering them peace of mind while purchasing a used vehicle," he said. NEW DELHI: Indian online automobile transactional marketplace Droom has launched the History - an unbiased certificate which curates historical data available through various authorised data providers to deliver in-depth information about a vehicle's background. Generated using Droom's proprietary technology, the certificate will address issues related with a vehicle's safety, trust, and value.
. This is largely due to the unavailability of verified information about a pre-owned vehicle. With History, we are making India's largest information repository for used vehicles." "By providing a certificate on vital vehicle-related information to a prospective buyer within minutes, we aim to foster greater trust and transparency in the used automobile segment." Droom constantly collects and updates vehicle information in over 18 unique data fields from 1000+ RTOs across the country. History currently has information about more than 19 crore private and commercial vehicles such as two-wheelers, cars, taxi, trucks etc in its database, with real-time information of nearly 6 million vehicles from the Delhi-NCR region alone. Somendra S Rathore, Senior Director, Product and Technology, Droom, added, The used vehicle market in India often faces issues such as low transparency and a distinct lack of trust between buyers and sellers. With History, we aim to plug this information gap by making a standardised, central repository for used vehicle history." "Integrating disparate IT systems and producing our own data science and machine tools over the past nine months has been a colossal task, but we're confident that our hard work will pay off and help India embrace a more digitally-driven economy." The process of generating the History certificate for a vehicle will be fairly simple. A user will have to do is enter the vehicle's VIN or registration number and check for the availability of the certificate. If the vehicle certificate is available in Droom's database, users can make an online payment to get the certificate sent to their registered email address within half an hour. The information can then be leveraged by users to make better purchases, ensuring the security of their investment and offering them peace of mind while purchasing a used vehicle. CHENNAI: Online marketplace for automobiles, Droom, has on Thursday launched ‘History' which will provide prospective second-hand vehicle buyers a comprehensive certificate on the product's background. History is an unbiased certificate which curates historical data available through various authorised data providers to deliver in-depth information about a vehicle's background. Generated using our proprietary technology, the certificate will address issues related with a vehicle's safety, trust, and value," said Droom Founder and CEO Sandeep Aggarwal. He added that unlike the US and Western Europe, India is a low trust market, especially for used automobiles. Several aspects of a pre-owned vehicle, such as ownership history, title dispute, and vehicle-related issues, are non-reliable. This is largely due to the unavailability of verified information about a pre-owned vehicle, he said. More than 19 crore private and commercial vehicles like cars, two-wheelers, taxi and trucks in its database with real-time information of nearly 6 million vehicles from the Delhi-NCR region alone will be available at History. 'history' is an unbiased certificate that will tell you your vehicle's background using historical data available through various authorized data providers to give you in-depth information. This registered technology will address issues related to vehicle's safety, trust, and value. The company claims to currently have 19 crore private and commercial vehicles such as two wheelers, cars, taxis, trucks etc in its database, with real time information of nearly 6 million vehicles in the Delhi-NCR region alone. 1) You will have to enter your vehicle's registration number and check the availability of the certificate. 2) If the certificate is available, then you can make an online payment to get the certificate sent to your email within 30 minutes. 3) This information can then be used by you to make better purchases and ensuring the security of their investment by using this tool. New Delhi, Dec 22 (PTI) Droom, an online marketplace for automobiles, has launched History which will provide prospective second-hand vehicle buyers a comprehensive certificate on the products background. "History is an unbiased certificate which curates historical data available through various authorised data providers to deliver in-depth information about a vehicles background. "Generated using our proprietary technology, the certificate will address issues related with a vehicles safety, trust, and value," Droom Founder and CEO Sandeep Aggarwal told reporters here. Users will have to enter the vehicles VIN or registration number and check for availability of the certificate. If the vehicle certificate is available in Drooms database, it will be sent to their registered email address. New Delhi [India], Dec 22 (ANI): Online automobile transactional marketplace Droom has announced the launch of History, which will curate historical data available through various authorized data providers to deliver in-depth information about a vehicle's background. "We are making India's largest information repository for used vehicles. By providing a certificate on vital vehicle-related information to a prospective buyer within minutes, we aim to foster greater trust and transparency in the used automobile segment," said Founder and CEO Droom, Sandeep Aggarwal. In order to present the most consolidated and transparent certificate to its users, Droom constantly collects and updates vehicle information in over 18 unique data fields from 1000+ RTOs across the country. Vehicle History currently has information about more than 19 crore private and commercial vehicles such as two-wheelers, cars, taxi, trucks etc in its database, with real-time information of nearly 6 million vehicles from the Delhi-NCR region alone. "With Vehicle History, we aim to plug this information gap by making a standardized, central repository for used vehicle history. Integrating disparate IT systems and producing our own data science and machine tools over the past nine months has been a colossal task, but we're confident that our hard work will pay off and help India embrace a more digitally-driven economy," said Senior Director Product and Technology Droom, Somendra S. Rathore. Gurugram-based online automobile marketplace, Droom has announced the launch of History. It is a certificate that curates historical data available through various authorised data providers to deliver in-depth information about a vehicle's background. Speaking on the launch, Sandeep Aggarwal, Founder & CEO, Droom, said, "Unlike the US and Western Europe, India is a low trust market, especially for used automobiles. Many aspects of a pre-owned vehicle, such as ownership history, title dispute, and vehicle-related issues, are non-reliable. This is largely due to the unavailability of verified information about a pre-owned vehicle. With History, we are making India's largest information repository for used vehicles. By providing a certificate on vital vehicle-related information to a prospective buyer within minutes, we aim to foster greater trust and transparency in the used automobile segment." In a move that once again underlines its pioneering status in the country's automobile industry, Droom, Indian online automobile transactional marketplace, has announced the launch of History. Vehicle History is an unbiased certificate which curates historical data available through various authorised data providers to deliver in-depth information about a vehicle's background. Generated using Droom's proprietary technology, the certificate will address issues related with a vehicle's safety, trust, and value. Speaking on the launch, Sandeep Aggarwal, Founder & CEO, Droom, said, "Unlike USA and Western Europe, India is a low trust market, especially for used automobiles. Many aspects of a pre-owned vehicle, such as ownership history, title dispute, and vehicle-related issues, are non-reliable. This is largely due to the unavailability of verified information about a pre-owned vehicle. With History, we are making India's largest information repository for used vehicles. By providing a certificate on vital vehicle-related information to a prospective buyer within minutes, we aim to foster greater trust and transparency in the used automobile segment." In order to present the most consolidated and transparent certificate to its users, Droom constantly collects and updates vehicle information in over 18 unique data fields from 1000+ RTOs across the country. History currently has information about more than 19 crore private and commercial vehicles such as two-wheelers, cars, taxi, trucks etc in its database, with real-time information of nearly 6 million vehicles from the Delhi-NCR region alone. During the first phase of the launch, Droom will put up listings with valid RC numbers on its platform. The front-end will also be soon opened to users, giving them access to the most accurate, real-time information about used vehicles. Somendra S. Rathore, Senior Director, Product and Technology, Droom, added, "The used vehicle market in India often faces issues such as low transparency and a distinct lack of trust between buyers and sellers. With History, we aim to plug this information gap by making a standardised, central repository for used vehicle history. Integrating disparate IT systems and producing our own data science and machine tools over the past nine months has been a colossal task, but we're confident that our hard work will pay off and help India embrace a more digitally-driven economy." The process of generating the History certificate for a vehicle will be fairly simple. All user will have to enter the vehicle's VIN or registration number and check for the availability of the certificate. If the vehicle certificate is available in Droom's database, users can get the certificate sent to their registered email address within half an hour for free of cost. The information can then be leveraged by users to make better purchases, ensuring the security of their investment and offering them peace of mind while purchasing a used vehicle. In June 2016, Droom has announced the closing of its Series B funding in a round led by BEENEXT from Singapore and Digital Garage from Japan. Majority of existing investors are participating in the current round including Lightbox and BEENOS. Also, in September, the company entered into a partnership with CashCare, an innovative consumer lending platform where short-term loans are provided on a real-time basis. 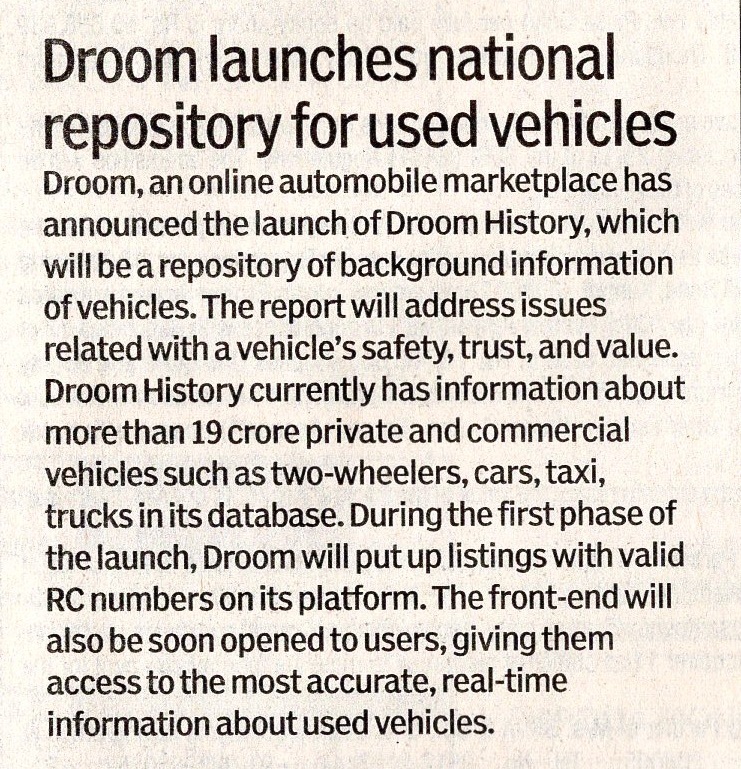 New Delhi, Dec 22 : Online automobile transactional marketplace Droom has announced the launch of History, which will curate historical data available through various authorized data providers to deliver in-depth information about a vehicle's background. [NK Business] Generated using Droom's proprietary technology, the certificate will address issues related with a vehicle's safety, trust, and value. "We are making India's largest information repository for used vehicles. By providing a certificate on vital vehicle-related information to a prospective buyer within minutes, we aim to foster greater trust and transparency in the used automobile segment," said Founder and CEO Droom, Sandeep Aggarwal. In order to present the most consolidated and transparent certificate to its users, Droom constantly collects and updates vehicle information in over 18 unique data fields from 1000+ RTOs across the country. History currently has information about more than 19 crore private and commercial vehicles such as two-wheelers, cars, taxi, trucks etc in its database, with real-time information of nearly 6 million vehicles from the Delhi-NCR region alone. During the first phase of the launch, Droom will put up listings with valid RC numbers on its platform. The front-end will also be soon opened to users, giving them access to the most accurate, real-time information about used vehicles. "With History, we aim to plug this information gap by making a standardized, central repository for used vehicle history. Integrating disparate IT systems and producing our own data science and machine tools over the past nine months has been a colossal task, but we're confident that our hard work will pay off and help India embrace a more digitally-driven economy," said Senior Director Product and Technology Droom, Somendra S. Rathore. If the vehicle certificate is available in Droom's database, users can make an online payment to get the certificate sent to their registered email address within half an hour. The information can then be leveraged by users to make better purchases, ensuring the security of their investment and offering them peace of mind while purchasing a used vehicle. New Delhi, Dec 22 : Online automobile transactional marketplace Droom has announced the launch of History, which will curate historical data available through various authorized data providers to deliver in-depth information about a vehicle's background. Generated using Droom's proprietary technology, the certificate will address issues related with a vehicle's safety, trust, and value. "We are making India's largest information repository for used vehicles. By providing a certificate on vital vehicle-related information to a prospective buyer within minutes, we aim to foster greater trust and transparency in the used automobile segment," said Founder and CEO Droom, Sandeep Aggarwal. In order to present the most consolidated and transparent certificate to its users, Droom constantly collects and updates vehicle information in over 18 unique data fields from 1000+ RTOs across the country. History currently has information about more than 19 crore private and commercial vehicles such as two-wheelers, cars, taxi, trucks etc in its database, with real-time information of nearly 6 million vehicles from the Delhi-NCR region alone. During the first phase of the launch, Droom will put up listings with valid RC numbers on its platform. The front-end will also be soon opened to users, giving them access to the most accurate, real-time information about used vehicles. "With History, we aim to plug this information gap by making a standardized, central repository for used vehicle history. Integrating disparate IT systems and producing our own data science and machine tools over the past nine months has been a colossal task, but we're confident that our hard work will pay off and help India embrace a more digitally-driven economy," said Senior Director Product and Technology Droom, Somendra S. Rathore. If the vehicle certificate is available in Droom's database, users can make an online payment to get the certificate sent to their registered email address within half an hour. The information can then be leveraged by users to make better purchases, ensuring the security of their investment and offering them peace of mind while purchasing a used vehicle. Droom has launched the Vehicle History. The History is an unbiased certificate which curates historical data available through various authorised data providers and the platform delivers in-depth information about a vehicle's background. For your information, Droom is an online automobile transactional marketplace. The Vehicle History is generated by using Droom's proprietary technology and the certificate will address issues related with a vehicle's safety, trust, and value. History, History Terms and Conditions, History Faqs, How to get history of vehicle, find history of vehicle In its first phase of launch, the Droom will put up listings with valid RC numbers on its platform. Apart from this, the Droom collects and update vehicle information from 1000+ RTOs across the country. In addition to this, Vehicle History currently has information about more than 19 crore private and commercial vehicles such as two-wheelers, cars, taxi, trucks, etc. in its database, with real-time information of nearly 6 million vehicles from the Delhi-NCR region alone. Speaking at the launch event, the front-end will be opened soon and it will give users to access the most accurate, real-time information about used vehicles. As a user, you can easily generate the Vehicle History certificate of the vehicle by entering the vehicle VIN or registration number & check for the availability of the certificate. If the vehicle certificate is available in Droom's database, users can make an online payment to get the certificate sent to their registered email address within half-an hour. The information can then be leveraged by users to make better purchases, ensuring the security of their investment and offering them peace of mind while purchasing a used vehicle. Speaking on the launch event, Sandeep Aggarwal, Founder & CEO, Droom, said: "Unlike USA and Western Europe, India is a low trust market, especially for used automobiles. Many aspects of a pre-owned vehicle, such as ownership history, title dispute, and vehicle-related issues, are non-reliable. This is largely due to the unavailability of verified information about a pre-owned vehicle. By providing a certificate on vital vehicle-related information to a prospective buyer within minutes, we aim to foster greater trust and transparency in the used automobile segment." Adding further, Somendra S. Rathore, Senior Director, Product and Technology, Droom, said: "The used vehicle market in India often faces issues such as low transparency and a distinct lack of trust between buyers and sellers. With Vehicle History, we aim to plugin this information gap by making a standard, central repository for used vehicle history. Integrating disparate IT systems and producing our own data science and machine tools over the past nine months has been a colossal task, but we're confident that our hard work will pay off and help India embrace a more digitally-driven economy." Droom has launched the Vehicle History. The History is an unbiased certificate which curates historical data available through various authorised data providers and the platform delivers in-depth information about a vehicle's background. For your information, Droom is an online automobile transactional marketplace. The Vehicle History is generated by using Droom's proprietary technology and the certificate will address issues related with a vehicle's safety, trust, and value. History, History Terms and Conditions, History Faqs, How to get history of vehicle, find history of vehicle In its first phase of launch, the Droom will put up listings with valid RC numbers on its platform. Apart from this, the Droom collects and update vehicle information from 1000+ RTOs across the country. In addition to this, Vehicle History currently has information about more than 19 crore private and commercial vehicles such as two-wheelers, cars, taxi, trucks, etc. in its database, with real-time information of nearly 6 million vehicles from the Delhi-NCR region alone. Speaking at the launch event, the front-end will be opened soon and it will give users to access the most accurate, real-time information about used vehicles. As a user, you can easily generate the Vehicle History certificate of the vehicle by entering the vehicle VIN or registration number & check for the availability of the certificate. If the vehicle certificate is available in Droom's database, users can make an online payment to get the certificate sent to their registered email address within half-an hour. The information can then be leveraged by users to make better purchases, ensuring the security of their investment and offering them peace of mind while purchasing a used vehicle. Speaking on the launch event, Sandeep Aggarwal, Founder & CEO, Droom, said: "Unlike USA and Western Europe, India is a low trust market, especially for used automobiles. Many aspects of a pre-owned vehicle, such as ownership history, title dispute, and vehicle-related issues, are non-reliable. This is largely due to the unavailability of verified information about a pre-owned vehicle. By providing a certificate on vital vehicle-related information to a prospective buyer within minutes, we aim to foster greater trust and transparency in the used automobile segment." Adding further, Somendra S. Rathore, Senior Director, Product and Technology, Droom, said: "The used vehicle market in India often faces issues such as low transparency and a distinct lack of trust between buyers and sellers. With History, we aim to plugin this information gap by making a standard, central repository for used vehicle history. Integrating disparate IT systems and producing our own data science and machine tools over the past nine months has been a colossal task, but we're confident that our hard work will pay off and help India embrace a more digitally-driven economy." NEW DELHI: Droom , an online marketplace for automobiles, has launched 'History' which will provide prospective second-hand vehicle buyers a comprehensive certificate on the product's background. Vehicle History is an unbiased certificate which curates historical data available through various authorised data providers to deliver in-depth information about a vehicle's background. "Many aspects of a pre-owned vehicle, such as ownership history, title dispute, and vehicle-related issues, are non-reliable. If the vehicle certificate is available in Droom's database, it will be sent to their registered email address. "The information can then be leveraged by users to make better purchases, ensuring the security of their investment and offering them peace of mind while purchasing a used vehicle," he said. New Delhi, Dec 22 : Online automobile transactional marketplace Droom has announced the launch of Vehicle History, which will curate historical data available through various authorized data providers to deliver in-depth information about a vehicle's background. Generated using Droom's proprietary technology, the certificate will address issues related with a vehicle's safety, trust, and value. "We are making India's largest information repository for used vehicles. By providing a certificate on vital vehicle-related information to a prospective buyer within minutes, we aim to foster greater trust and transparency in the used automobile segment," said Founder and CEO Droom, Sandeep Aggarwal. In order to present the most consolidated and transparent certificate to its users, Droom constantly collects and updates vehicle information in over 18 unique data fields from 1000+ RTOs across the country. History currently has information about more than 19 crore private and commercial vehicles such as two-wheelers, cars, taxi, trucks etc in its database, with real-time information of nearly 6 million vehicles from the Delhi-NCR region alone. During the first phase of the launch, Droom will put up listings with valid RC numbers on its platform. The front-end will also be soon opened to users, giving them access to the most accurate, real-time information about used vehicles. "With History, we aim to plug this information gap by making a standardized, central repository for used vehicle history. Integrating disparate IT systems and producing our own data science and machine tools over the past nine months has been a colossal task, but we're confident that our hard work will pay off and help India embrace a more digitally-driven economy," said Senior Director Product and Technology Droom, Somendra S. Rathore. If the vehicle certificate is available in Droom's database, users can make an online payment to get the certificate sent to their registered email address within half an hour. The information can then be leveraged by users to make better purchases, ensuring the security of their investment and offering them peace of mind while purchasing a used vehicle.